For a few brief seconds, the rain stopped pummelling the front windscreen of the storm chasers' truck. Not that the weather was clearing - Kelley Gene Williamson and Randall Yarnall were heading north, directly towards the storm. At the time, on 28 March 2017, they were covering the event for the Weather Channel programme Storm Wranglers. As they neared a junction a few miles outside Spur, Texas, a bright red Stop sign came into view on the right-hand side of the road. Yarnall was driving his Chevrolet truck at about 70mph (113km/h) at the time, according to a lawsuit filed on Tuesday. A video the friends were live-streaming for the Weather Channel's Facebook page showed they made no attempt to stop at the junction. The footage cut out a split second before a Jeep driven by Corbin Jaeger drove westbound into the junction. Jaeger, who had the right of way, was driving away from the storm. Williamson, Yarnall and Jaeger - a respected storm chaser working for the National Weather Service - were all killed on the spot. The lawsuit, filed by Jaeger's mother, seeks up to $125m (£95m) in damages. It puts the blame firmly at the door of Williamson and Yarnall, whom it calls "habitually reckless and dangerous", as well as the Weather Channel. The lawsuit also alleges that the network's "concept of presenting storm chasing as an adventurous, thrilling sporting event and to make its two stars 'heroes'" caused her son's death. The official history of tornado forecasting began in Oklahoma City in a rather informal fashion. When a tornado ploughed through Tinker Air Force Base on 20 March 1948, it was the costliest in Oklahoma's history. It destroyed 32 military planes, tossing them across the runway with recorded wind speeds of 78mph (126km/h). An investigation was launched, and Major Ernest Fawbush and Captain Robert Miller began compiling weather data from before and after the storm - only to realise just five days later that conditions were worryingly similar to those of 20 March. The base issued the first ever official tornado forecast. Men found cover and aircraft were put away into hangars, before another storm of similar intensity passed through. Within just a few years, the Severe Local Storm Warning Center was created to predict storms, based in part on Fawbush and Miller's indicators. But even then, predictions remained unreliable. Forecasters were often wary to announce storms for fear of causing panic or making people complacent if the storms did not appear. It was only through adopting computers in the 1960s that forecasters' work became more reliable, and as the science of storm prediction became more accurate, storm chasing soon developed into a phenomenon. David Hoadley is credited as being the father of the pursuit. After a thunderstorm tore through his hometown of Bismarck, North Dakota, in 1956, he began studying and tracking extreme weather across the US. In a magazine interview, Hoadley described setting off alone to see his first major tornado, driving against a wave of fleeing traffic near Dodge City, Kansas, in 1965. "It was a moment I'll always remember - the police radio; the patrolman describing some unreal, hypnotic event; the ghostly sirens moaning in the wind; and that classic cone tornado, so close and deceptively graceful as it descended to create a moment of history in the life of a small town." In the 1970s, the National Weather Service (NWS) created the Skywarn programme to train storm spotters. After a two-hour training course, volunteers around the country provide reports on dangerous weather. Their main responsibility is to inform the service about severe local storms. The NWS says there are now about 400,000 trained weather spotters across the US, and while not all chase tornadoes, there has been an anecdotal rise over the past 25 years in the number of people turning out to follow storms. Storm chasers tend to put this down to one event: the release of the film Twister in 1996. The film, starring Bill Paxton and Helen Hunt, profiles a team of principled but poorly-funded tornado chasers competing against richer rivals. One meteorologist reported that the number of meteorology graduates jumped 47% in the years after the film was released. During the peak tornado season, typically from April to June, hundreds of storm chasers can gather in parts of the Great Plains in the US, especially in states like Oklahoma, Kansas and Texas. There are now even tour operators who take groups out to chase storms throughout Tornado Alley - a vertical belt across the US where the storms usually form. But despite the risks of tailing a violent and unpredictable weather system, the first deaths of storm chasers directly attributed to a tornado itself were in 2013. Early in the evening of 31 May that year, a violent weather system produced eight tornadoes near Oklahoma City in a little more than two hours. One proved much more damaging than the others. The tornado that struck near the town of El Reno was the largest ever recorded - stretching across 2.6 miles (4.2 km) and carrying winds of up to 302mph. The tornado and associated flooding killed 22 people, including four storm chasers. Three of those were experienced, and known to be responsible, but were caught out when the tornado accelerated and suddenly changed direction. The fourth victim was a local inexperienced storm chaser who drove directly into the tornado's path. They weren't the only ones around that day. An animation produced by one weather watcher showed how many registered storm chasers were in the path of the tornado as it struck. Most storm chaser deaths - seven - have been in car accidents, and all but one of those have occurred since 2005. Even before the fatal collision in Texas in 2017, one meteorologist and storm spotter of 45 years, Charles Doswell, had warned of the risks some chasers were taking while driving after he witnessed the aftermath of one collision. In a follow-up blog post written after Williamson, Yarnall and Jaeger's deaths, Doswell said he was increasingly concerned about "chaser hordes" who were obsessed with getting as close as possible to tornadoes, rather than observing from a safe distance. "The time is long overdue to get serious about ceasing illegal and unsafe driving during a storm chase [or any other time, for that matter!]. No one gets a free pass on the roads, and this includes people chasing for TV." The Weather Channel is not alone in broadcasting thrilling documentaries chronicling the lives of storm chasers: the Discovery Channel, National Geographic and the BBC, among many others, have done so too. But the lawsuit against the Weather Channel alleges that the network had been warned by other storm chasers about Williamson and Yarnall's "history of reckless driving". It also says that their failure to stop at the junction where the collision occurred was their fourth traffic violation that day. "Instead of using meteorologists experienced in the tracking of tornadoes," the lawsuit says, the Weather Channel "knowingly chose two chicken farmers and cattle ranchers from Missouri without any emergency/first responder or meteorological training to star in their show. "TWC then instructed them to barrel into dangerous weather conditions to obtain footage, needlessly endangering local residents fleeing impending catastrophe." Meteorologists and storm chasers appear split over whether televised storm chasing is increasing risks to people on the ground, and whether those live-streaming tornadoes for television are providing a valuable service or not. Jeff Frame, of the University of Illinois' Department of Atmospheric Sciences, says forecasters often watch live streams to understand a storm's changes in real time. Images distributed from the scene on social media are often "extremely helpful" for those who need to issue warnings, he adds. But meteorologist Ryan Maue says he could see "no net benefit to live storm chasing on TV" and that "the risk to chase the storms may outweigh the arguably minimal extra information provided" to forecasters. Tour operators say they warn groups about the dangers of what Kim George at Tempest Tours calls "citizen chasers", which she says is "a greater issue every year". "When you have too many people going down the same roads, it can be difficult to stop and move off the road," she says. "We have a radar that shows where most of the chasers are converging and we avoid those areas." A spokesperson for Cloud 9 Tours agrees, advising people "to look both ways before crossing the road - even if it's a one-way road". "Other chasers may be focused on the storm and not watching the road ahead of them." For Dr Frame, who will take a group of students to the Great Plains in May and June, the number of people storm chasing is not the problem - this has remained fairly constant since the mid-2000s, he says. The bigger problem, he says, is bad driving from chasers who are either distracted by the storm, do not park far enough off the road to keep it clear, or who do not rest sufficiently before chasing. "I would say it is a few bad apples," he says. "Most storm chasers are safe." Captain Paul Timmons agrees. He has worked for the Oklahoma Highway Patrol for three decades and he says chasers typically don't cause problems on the roads. "It kind of depends on the season," he says. "There are some people who go out storm chasing just to get a closer view of a tornado or a hail storm, and they end up having to ride it out." "Leave it to the professionals," he advises. Dr Frame also says that problems are likely to occur among inexperienced chasers who have a greater tendency to panic when they find themselves trapped by a storm that changes direction suddenly. Inexperienced chasers should look to buddy up with someone who better understands storm systems, he says. Controlling crowds of enthusiasts is not the answer, Ryan Maue says: simple good, sensible behaviour is. 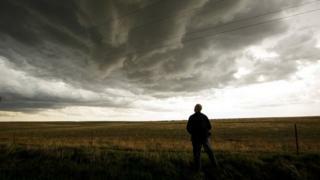 "Special laws are not required in the US to regulate storm chasing," he says. "The activity is entirely legal as long as one adheres to appropriate traffic laws, stays in a safe position with respect to the storm, and does not waste the time of emergency responders by blocking roads. "Common sense goes a long way and this tragedy in Texas could have easily been prevented."